I was stunned and smile after i saw the video below from Reuters regarding the Philippines as one of the new “Breakout Nations” per analysis of the Morgan Stanley Investment Management. “Breakout Nations” are countries that could sustain fast growth. Compared to other countries the TIP(Turkey, Indonesia, Philippines) have reasonable expectations from investors. The only thing that TIP should do is to increase its per capita income or the income per person which is calculated by the quotient between the gross national income or the gross domestic product and the total population. Indonesia and the Philippines have to increase by 5% its per capita income by 2017 to achieve the world’s GDP per capita of $5,000 (P215,000). This could be achieved by increasing our GDP while having an aggressive population control program. 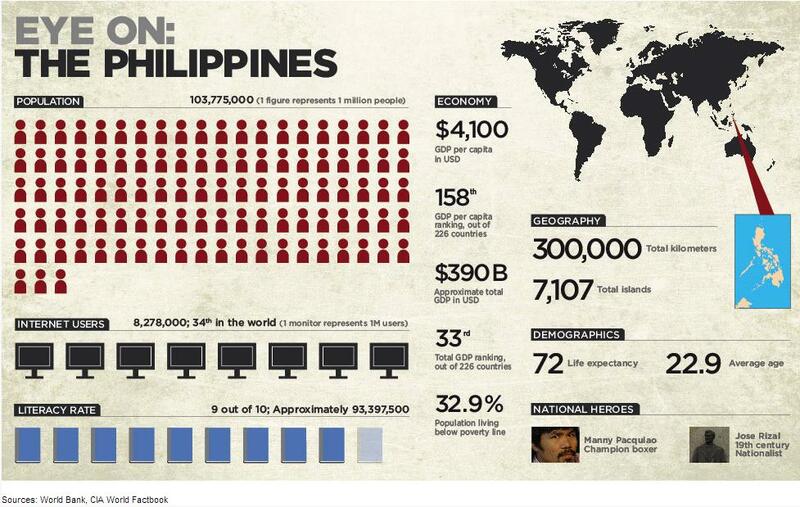 Here’s a chart for the Philippines published in CNN’s Eye On quoting the data from the World Bank and CIA Fact Book. Good luck to us and Mabuhay Philippines… Let’s have morefuninthePhilippines! ← USC-KNN Season 7 is On! I’d told you.. we must reduce for us to grow… Read: THERE ARE SIMPLY too many babies being born in the Philippines, making it “very hard” for poverty-reduction efforts to make even a dent, according to one of the world’s most influential economists. Continue here. @MG but GDP is not the real indicator of quality of living. There are some nations that have less GDP but quality of life is better simply because government services are more adequate for the population. Less population= less people to govern and manage = better management. For developing nations such as the Philippines, we need to control population growth and increase skilled percentage. I think you missed the point. If you increase the GDP per capita partially by population control, you’ll only marginally increase GDP which is the real indicator of wealth. Let’s not forget that one key criteria for identifying the BRIC nations and now the TIP breakout nations is strong demographics, i.e. Population, and to some yet lesser extent, it’s skilled population. It tells you that population control is economically unsound. We are already a nation of skilled population but we are exporting our skilled people. While increasing our GDP, there must be parallel programs like population control. When over population is economically sound?